Read HERE about the clubs that use the hall and forthcoming events. In September 2002 we celebrated the 75th Anniversary of the hall, read HERE about it's origins. Click HERE for an old postcard - can you date it? 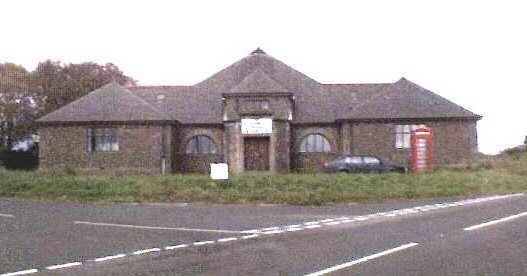 The hall is situated at the junction of the B961 to Brechin, and the road to Monikie Village and Monikie Country Park. (Look at map). The hall was erected for the use of the community, to the memory of the War Dead - a plaque to that effect can be seen just inside the front door. (You may wish to visit the Commonwealth War Graves Commission website and research your ancestors who died in British military service. The C.W.G.C. is a very busy website - please make sure that the first page is complete before proceeding further.) The following names appear in the churches at Monikie and Newbigging. The Hall Committee sometimes publish a newsletter which is available locally - ensure you get your copy. In the following sections you will find the names of the local servicemen who gave the ultimate sacrifice for their country. You may wish to look at more detail about most of these men. From the Memorial Tablets in Monikie Kirk. # The Webmaster has been advised of an amendment to information the soldier named above on the plaque. It should be Pte. Thomas Niven Scott (born 1899 of the Seaforth Highlanders 5th Battalion. He died 2nd August 1918 and is buried at Sezanne Communal Cemetery. (His brother is Gunner Robert Scott above). From the Memorial Tablet in Newbigging Church for World War I. You may wish to look HERE for more information about most of these men. 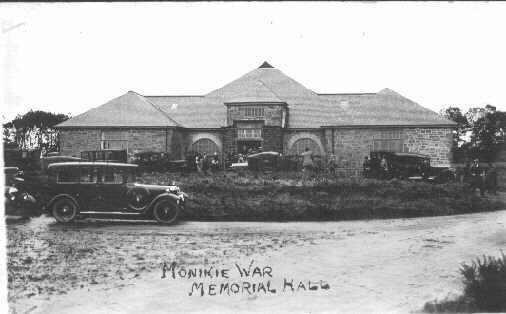 Look here for images of pages from the booklet, First World War "Roll of Honour for Monikie Public School"
This hall is operated as a charitable organisation and is dependant on donations, collections and fees. A generous proportion of the funds raised by selling copies of 'The Monikie Story' has been donated to the hall charity. In that book you can read about the hall and much else about this parish down through the ages.